We often have birds nesting in our courtyard in Australia, it’s totally enclosed so they’re safe from cats and other intruders. 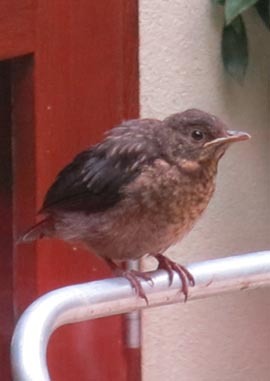 The last few years it has been blackbirds, which are an exotic, ie not a native Australian bird. This year they produced not one, but three chicks. They’d hatched out soon after Christmas, but didn’t appear out of the nest until January. 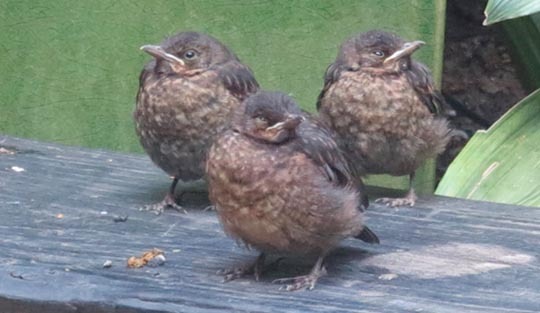 ▲ Then they just sat around, looking fat and lazy, making no effort to learn to fly, just lazing around like the fat little butterballs they were, waiting for their parents to stuff worms down their greedy little throats. Or rather waiting for dad (he really is a blackbird) because pretty soon mom (who is more of a brownbird, and bigger than dad) wasn’t showing up. With blackbirds once a batch have hatched out mom lays more eggs and gets back to brooding the next batch. Dad is left to do the feeding and he was certainly assiduous about it. Out in the backyard we had lots of birds squabbling over the flowers in a travellers palm, sometimes a half dozen at a time. 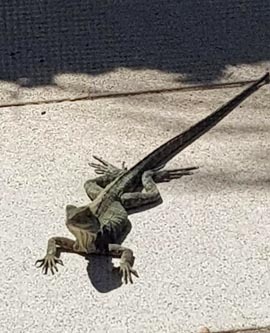 ▲ Plus our Gippsland water dragon turned up so regularly we began to feel unhappy if it wasn’t out there come sundowner time in the evening. We’d named it Puff, as you’d name any magic dragon, but in fact it might be Puff 1 and Puff 2, they appeared to be different sizes although we never saw both at the same time. 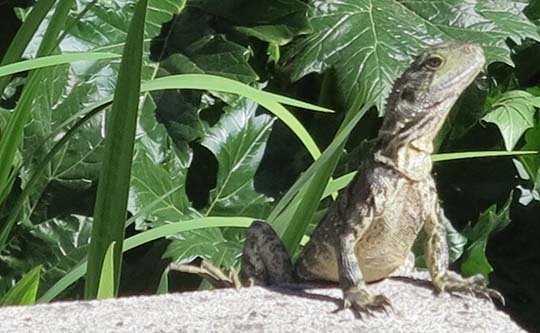 They’re very similar to the eastern water dragons we saw on the Manly Walk in Sydney recently. ◄ Then Puff disappeared and for several months I’ve not seen Puff 1 or 2 at all. I think one or other is still around, however. A visitor – when I wasn’t home – spotted it recently. I certainly hope so, I like having a dragon around the place.